—For those of you floating aimlessly (or otherwise) around the Nashville area, I’m going to be playing a free show at the Basement next week Tuesday (Feb 1). The show starts at 8pm and it’s 21+. A couple very talented friends of mine are going to be joining me for the first time, so I’m pretty excited about that. If you’re wondering what my excited face looks like, picture my normal face and then change nothing about it. It’s like that. I really am excited, I’m just bad at showing it. I am really astounded by how many of you guys have taken the time to pick up a copy of “The Streets Will Turn to Streams” since it was released a week ago. I had no idea what to expect, but the response has really been wonderful. It’s things like this (and people like you) that keep me working towards whatever this is I’m working towards (struggling forward as a human being, as a musician, figuring out what it means and what it looks like to share those things with you). “The Streets Will Turn to Streams” is released gently, like a dove or a homing pigeon! The day of reckoning is upon us. It’s been a long time coming. It was a year and two days ago that I first contacted Dustin Anderson (who engineered and mixed the album) about recording these songs. Fast forward 367 days, and the limited edition hand-made copies of “The Streets Will Turn to Streams” are finally available for you to enjoy. You can make your way over to the shop to pick up a copy or four. Thursday is a mellow sort of a day. It’s not the weekend yet, but it’s the fourth weekday in a row, and you’re getting kind of sick of them. 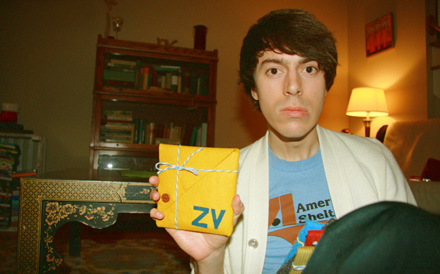 We here at Zachvinson.com (I find that saying “we” instead of “me” makes me sound much more legitimate) know the feeling, and we (me) are here for you. New Song! 4 days till album release! I was going to give you all a free Christmas song that I recorded a couple years back, but then I listened to it again. I’m a big fan of having a real Christmas tree in the house. We got going on it a little bit late this year, but we finally tracked down a tree about a week ago. In a week, our tree has not sucked up any water, but still looks as fresh as ever–which makes me wonder if somehow we got duped into buying a fake tree. I decided to be much more hands-on with the manufacturing of “The Streets Will Turn to Streams.” It’s really convenient to send all your art files off to some company who will take care of everything for you (not that that’s a bad thing), but I’ve put a lot of myself into the music on this album and it only seemed right to continue that in the making of these CD cases. Also, I thought it would save me money, but that has turned out to be untrue.